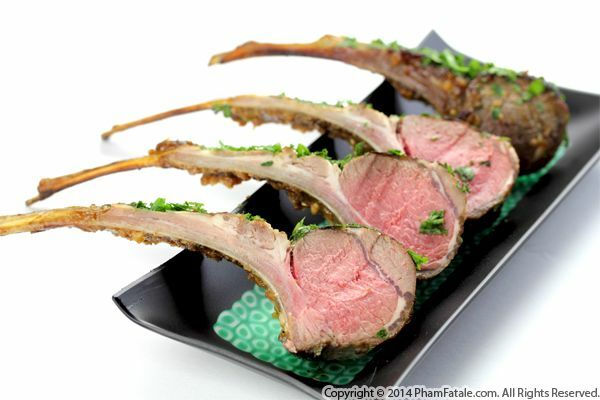 If you love lamb as much I as do, you've got to try this dish. The preparation is effortless. It's so easy, even my husband's oldest teenage sister, Sunny, who's a vegetarian, could make it. I jokingly told her she has to learn a few meat dishes so when she gets married she'll know a few basics in cooking. Sunny was a bit frightened handling the roast at first but she overcame her fear and wrapped the meat in fresh herbs and helped me tie it. Now that's dedication. 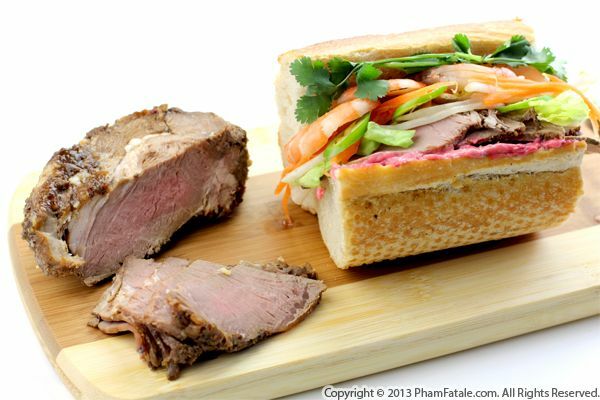 The next day, I cut the leftover meat paper-thin and used it as a filling in a fusion-style banh mi. You can find the various condiment elements in these traditional banh mi sandwiches in my latest cookbook, aptly titled "Banh Mi, 75 Banh Mi recipes for Authentic & Delicious Vietnamese Sandwiches". A few steps are essential to master the classic roast of lamb. 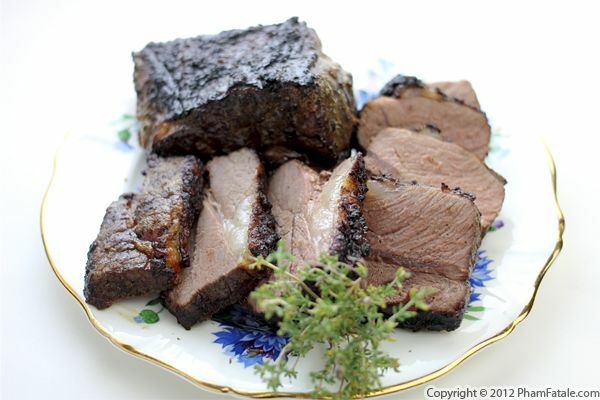 First, make sure you select a boneless leg of lamb, trim any excess fat, then marinate it in a citrus and herb marinade. 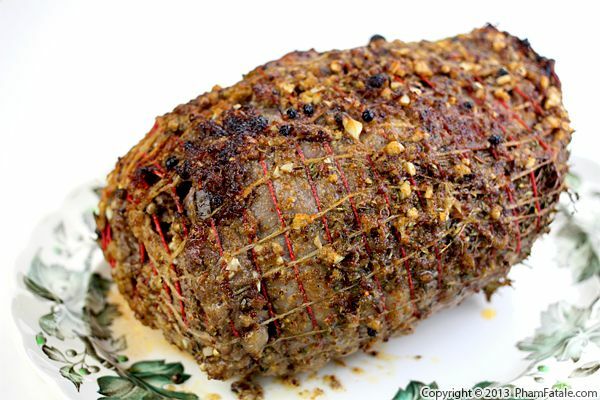 Finally, tie it tightly and roast to perfection in the oven. 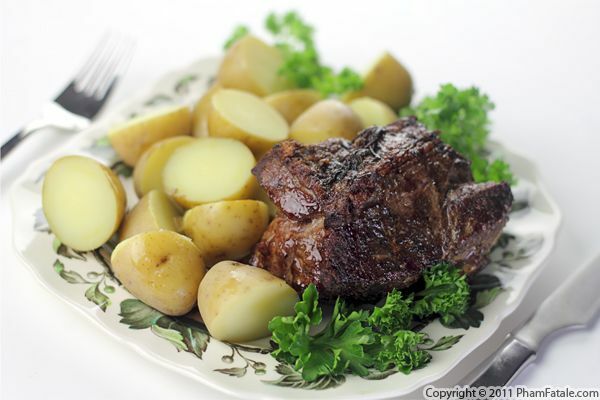 One of Papa's favorite meats is lamb. This morning, my husband Lulu and I left early and went to the open air "Les Sablons" market in Neuilly-sur-Seine, in a suburb of Paris. It's a small market but it holds a lot of delicious treasures. I bought two beautiful lamb sirloin steaks and we headed home right away, so I could prepare lunch for my parents. The cut of meat is so fresh, no marinating time is necessary. 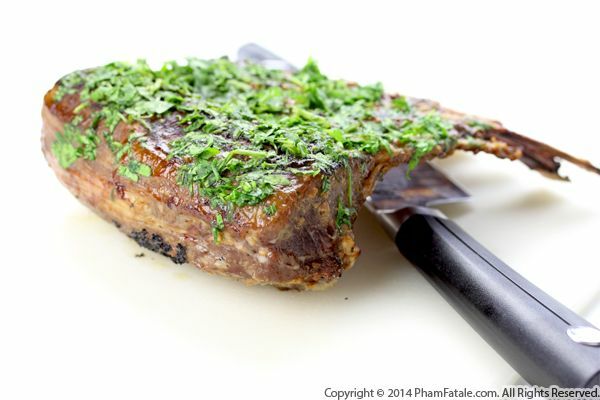 The main preparation consists of searing all sides then finishing the cooking in the oven. I got a little distracted and waited a bit too long to take a photo right after slicing the meat. Ordinarily, the color of the meat should look a touch pinker!